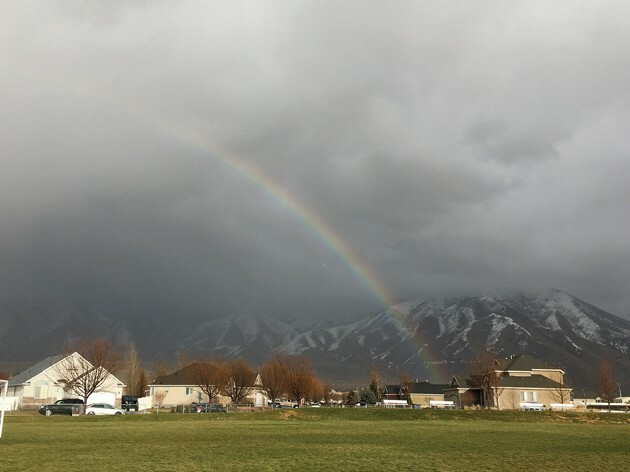 An early March storm brings a rainbow to the skies above Stansbury. 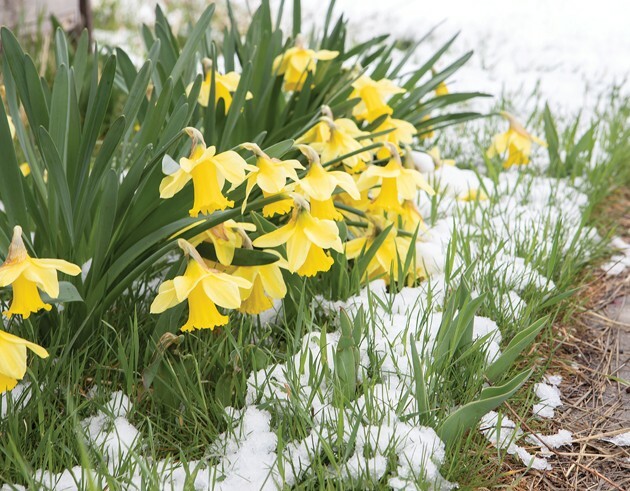 March’s weather waffled between winter and spring bringing snow, rain, sun and above-normal precipitation to the Tooele area. 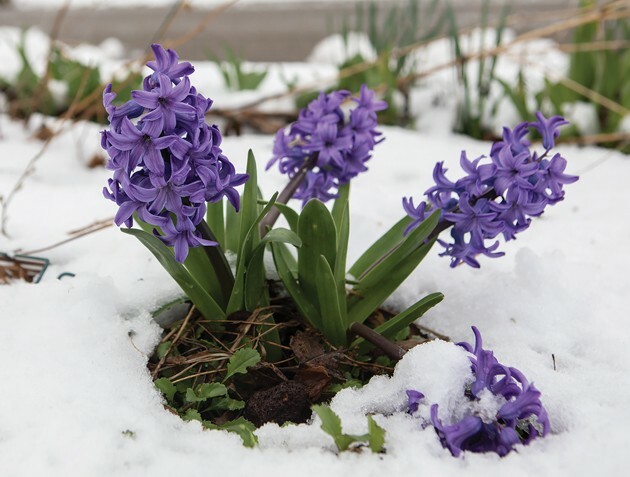 Flowers peek out of the snow in Tooele City. The storm blanketed them with a couple of inches of snow while the mountains received more. Settlement Canyon Reservior is at 44% of total capacity with more spring runoff expected in the coming months. The wetter water year for Tooele County continued in March, causing the U.S. Drought Monitor to lift its drought designation from nearly all of Tooele County. Only 3.2% of the county remained in a drought condition as of April 2, according to the U.S. Drought Monitor. The area of Tooele County remaining in drought is so small it doesn’t show up on the Drought Monitor’s map. 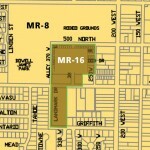 According to the monitor’s statistical table, nobody lives in the area. The western part of Tooele County, comprising 63% of the county, is designated as no drought. The eastern part of Tooele County, consisting of 33.8% of the county, is designated as drought level zero, a level not considered as a drought by the U.S. Drought Monitor. It is a designation used for areas showing dryness but not yet in drought, or for areas recovering from drought. Tooele County’s pattern of increased precipitation for the water year was part of a statewide trend, according to the National Resources Conservation Service’s March Utah Climate and Water Report. “Drought conditions continued to improve across the state in March. … Looking ahead to the wet pattern predicted, drought conditions are likely to continue to improve in April,” reads the NRCS report. Mountain ranges in Tooele and Rush valleys are covered with a higher than normal amount of snow. 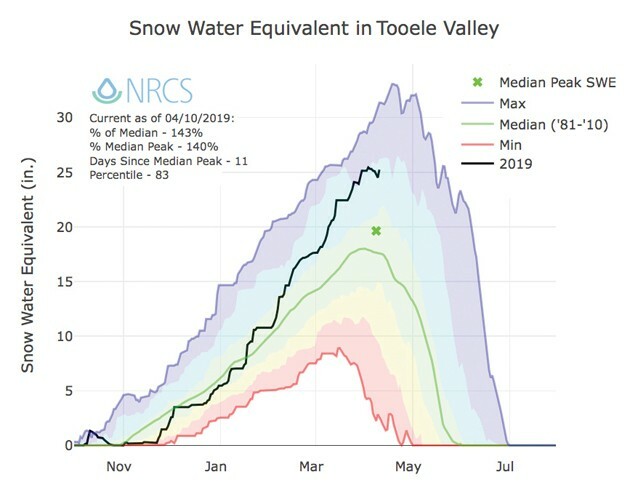 The snow water equivalent, or amount of water in the snow pack, in Tooele Valley was at an average of 152 percent of the 30-year median as of March 31, 2019, according to data collected by NRCS SNOTEL sites. 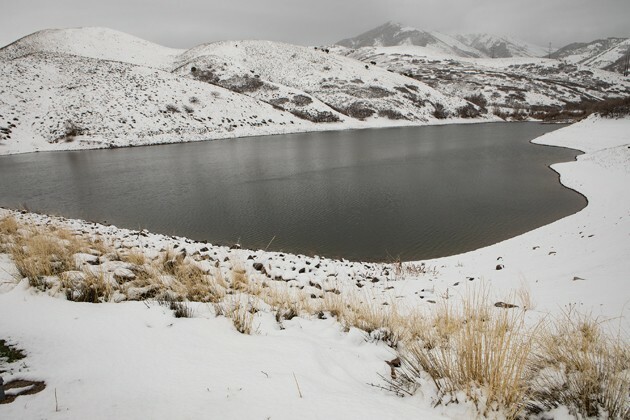 The Mining Fork SNOTEL site in South Willow Fork of the Stansbury Mountains reported 23.6 inches of snow water equivalent as of March 30, which is 132% of the median amount of snow water equivalent for the month of March. In the Oquirrh Mountains, the Rocky Basin – Settlement Canyon SNOTEL site reported 34.6 inches of snow water equivalent, which is 157% of the median. The Vernon Creek SNOTEL site in the Sheeprock Mountains reported 14.9 inches of snow water equivalent, or 186% of the median. Ned Bevan, Tooele City weather observer for the National Weather Service, said his reporting station received 3.08 inches of total precipitation during March. Normal precipitation for the month is 2.32 inches. 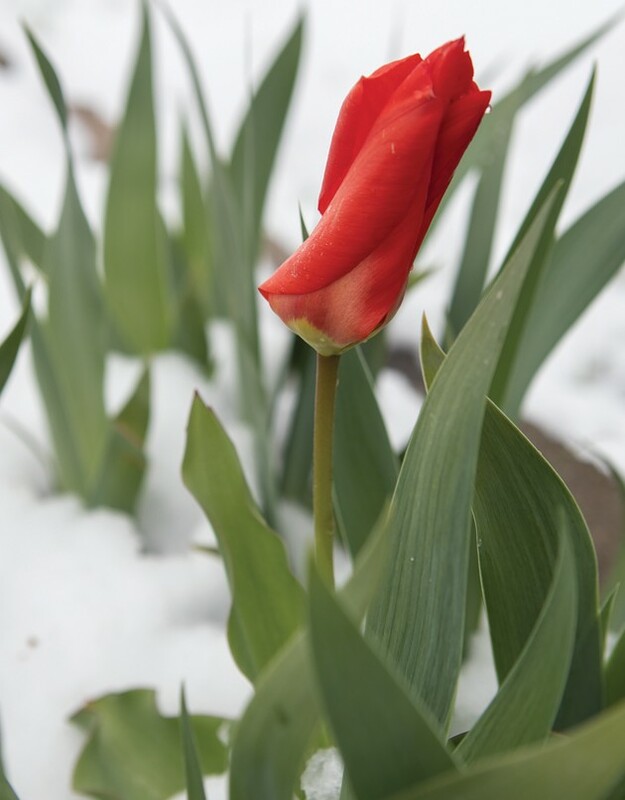 There was also more snow than normal during March in Tooele City with 19.6 inches. Normal snowfall for March in Tooele City is 16 inches. Total precipitation for the water year in Tooele City, which started Oct. 1, was 12.57 inches as of March 31, according to Bevan. Normal total precipitation as of March 31 in Tooele City is 9.70 inches. 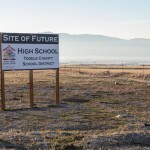 Bevan reported that temperatures in Tooele City during March have ranged from a high of 65 degrees on March 26 and 27 to a low of 22 degrees on March 15. The NRCS water run-off season starts in April. As the run-off season starts, Settlement Canyon Reservoir is at 44% of total capacity and Grantsville reservoir is at 61%, according to NRCS data. According to the National Weather Service’s Climate Prediction Center, the forecast for the next 10 days in Tooele County is for temperatures in the normal range and precipitation ranging from normal to slightly above normal. The U.S. Drought Monitor is jointly produced by the National Drought Mitigation Center at the University of Nebraska-Lincoln, the United States Department of Agriculture, and the National Oceanic and Atmospheric Administration. SNOTEL, or snow telemetry, are remote battery powered sites across western mountains that automatically measure and transmit information about snow depth, water content, rainfall and air temperature. 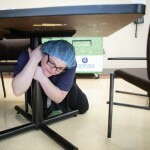 They are managed by the USDA’s National Resources and Conservation Service.